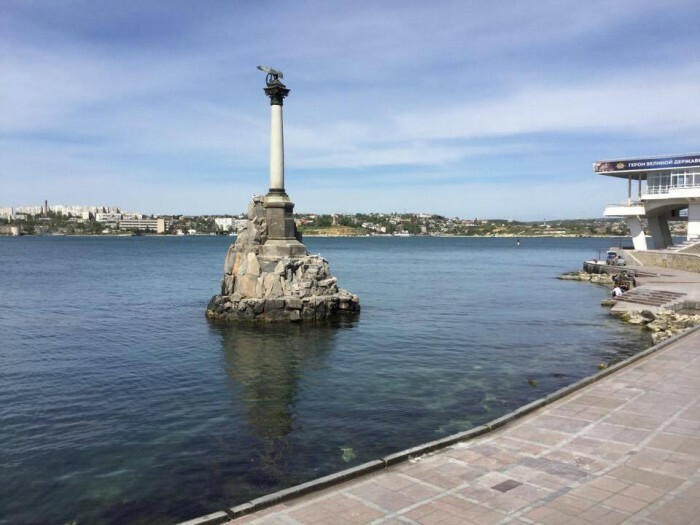 A desolation reigns in occupied by Russian Federation Sevastopol city that is in Crimea. 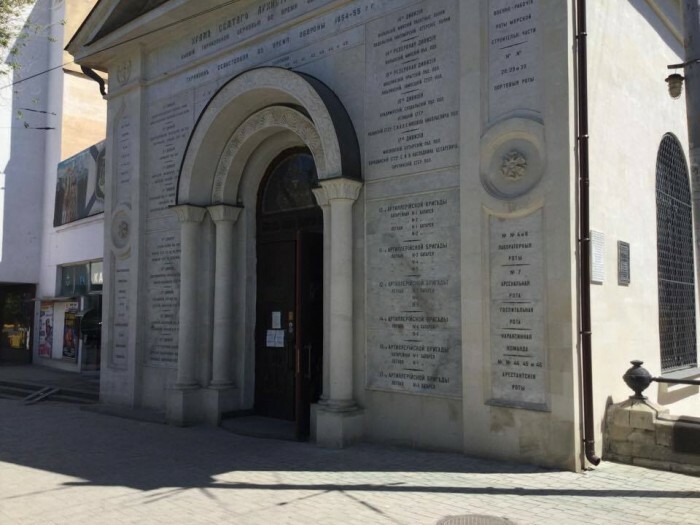 A few years ago it was a bustling city, but now it turned in ‘quiet Soviet town’. The source from locals has reported about it to the correspondent of Informator.media. It’s noted that streets of the city are empty. For example, there are no such noisy crowd, which was usual in the ‘pre-occupation’ period, at the height of the day. Locals accented that the middle of a May is the ‘confident holiday season’. Otherwise, there hasn’t been being the influx of tourists already for four years – the flow of them runs low. ‘Seafront is a half-empty. It’s an absurd, nonsense, it can’t be so! There always was a crowd. Everybody were making pictures, laughing, smiling. And now you see what is the landscape under this symbol (poster ‘Crimea is ours’ – ed. )’, local told. According to his words, the number of holidaymakers on the beaches decreased too. There are no ideal order as it was before the occupation. Tourists are unpleasant about this situation and locals only ‘shrug their shoulders’. ‘People are quiet and frightened – they understood at all that Russian power is going to use Crimea only like a military base. There are no speech about some help to population, infrastructure development or touristic sector’, the source reported. 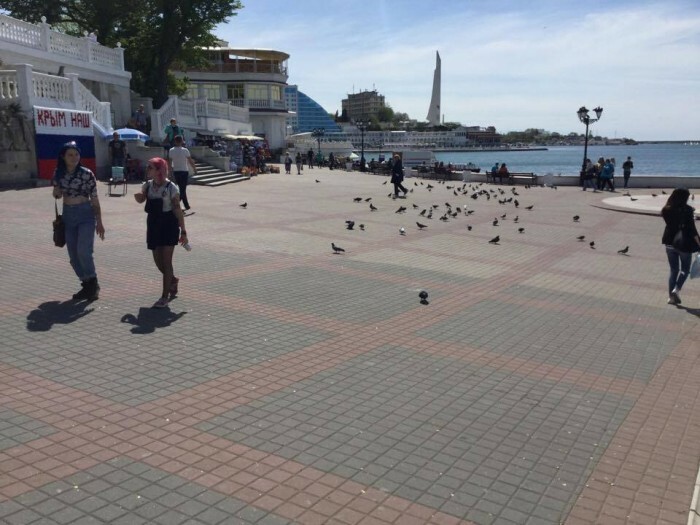 Local residents don’t like to spread an information about what Russians are bringing to Crimea – neither in private messages, nor in social media. ‘We understand that our house turns in barracks, military facility, landfill… The feeling of a home is disappearing, losing. And it’s not clearly understood how to come it back. We adequate people, don’t loss conscience (and there are a lot of such people, believe us! ), we really hope to come back to Ukraine. Russia is not a home for us’, Crimean inhabitant added. 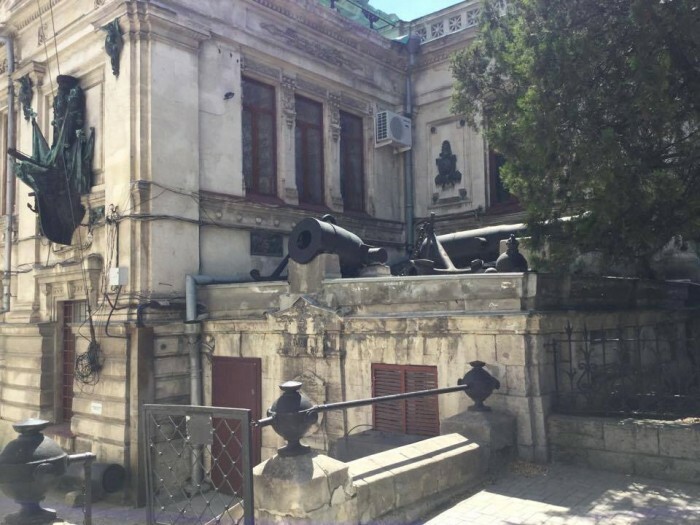 According to words of Sevastopol resident, locals were waiting for some steps from Russian government in first half a year of an occupation. Such actions should witness that Russia needs Crimea and this also was very important for a number of Crimean people and for Russians too. But Russian citizens don’t rush on Crimean resorts, preferring annexed peninsula shores Turkish hotels and swimming pools. ‘Some here, who ran to vote on referendum with a foam at the mouth, now ask: ‘Why they need us?’. But, really, when you watch TV, you see there smiling people of Russia, who’re chanting: ‘Crimea is ours!’ and in real life they have never been here. I don’t understand, what caused all this hysteria and in practice we’re cut by block-posts and nobody needs us’, tells the man. Sevastopol dweller said that the enthusiasm for perception of prospects faded in the society during the occupation period. Simply, people don’t see them at all. ‘So, what perspectives can be here? I’m working, the entrepreneur, still young. I don’t afraid of difficulties, because I don’t have another exit… There is nothing for me to go to, I don’t want to start from the beginning. I began to feel good in business only for two years before an occupation, where is the sense to throw all of it away and to leave and where? But I understand that all of it only for a piece of bread to feed my children. There is no future in this situation’, a man shares his opinion. ‘Even orthodox ‘Crimea-is-ours’ representatives keep silence last time – arguments in favor of ‘happy future with Russia’ are getting smaller. But, of course, there are happy with the new regime. But this can’t be cured’, the source reported. Sevastopol residents also pay attention on the desolation of the infrastructure objects except the absence of usual tourist crowd in Sevastopol. ‘Look at our streets, houses, buildings. They looked in another way earlier. 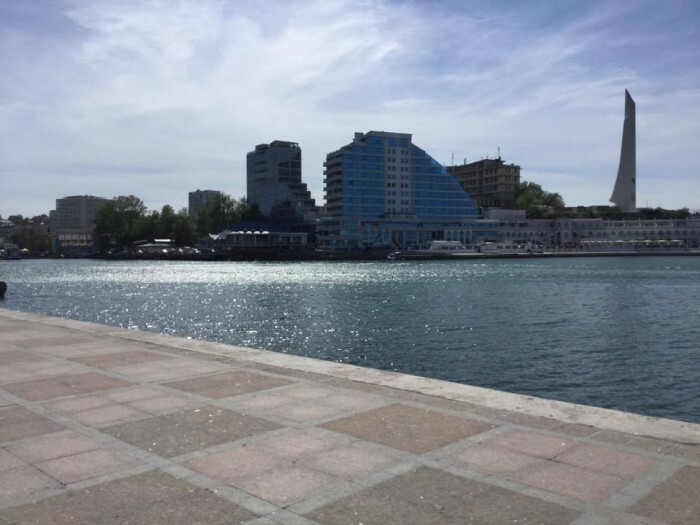 Yes, the dilapidation problem was here earlier, but now our new ‘authorities’ showed that they don’t care about appearance of peninsula cities’, tells the dweller of Sevastopol. According to his words, utilities are coping with their duties, but in such a way that it seems that new ‘power’, maybe, has another view about how a decent city in which people come, must look like. Otherwise, Soviet symbolism can be often met on city’s buildings, banners, adverts. 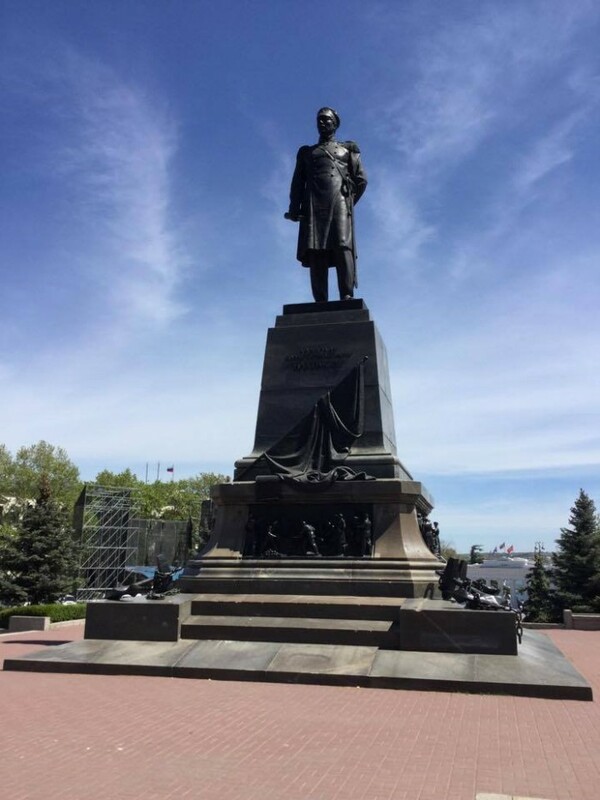 We would remind that it’s banned on a free Ukraine territory by decommunization law. ‘They (‘authorities’ of an occupied city – ed.) 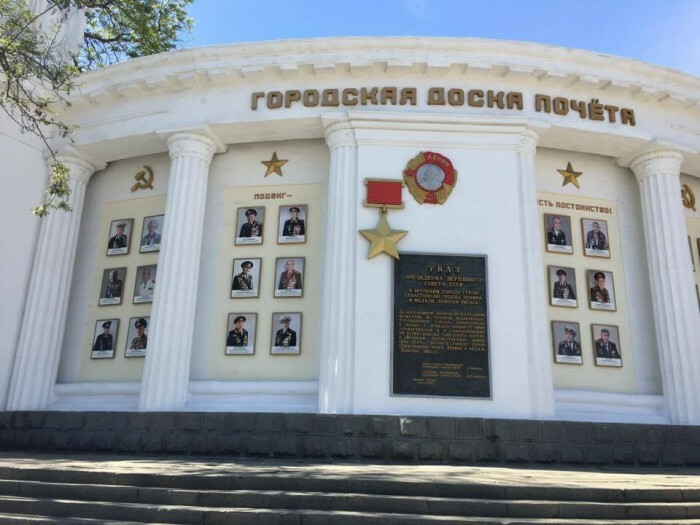 maybe want to cause the feeling of joy and returning to USSR among the local population… But everyone, who has a little bit of an objective memory, knows very good and don’t forget what the USSR is – queues, high cost, shortage of the most necessary’, the Sevastopol’s local tells. He also told that there are those, who is fan of Soviet Union, but they also need something to eat. ‘The sausages of 2.20 Soviet rubles (~$1.175) cost won’t appear on the shop counterfeits after talks about them and people begin to understand it’. ‘So, Crimea is closer to a ‘light future’. But who wants to live such life? I don’t want for example’, the resident of occupied city emphasized. ‘We believe, we really believe in liberation. We try not to succumb to despair, propaganda and fatigue. We only live and work here. But step-by-step, you want to or not, you get used to this situation, you know? Nobody likes to get used to the yoke. So, we hope to come back to Ukraine. We don’t want to think about another future’, a man resumed.